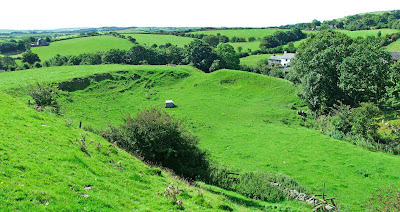 Pennington's Castle Hill, was an early medieval ringwork, situated about a mile and a half East of Ulverston, and just off the A590. The remains sit high up on an escarpment, protected on the North and East sides by a ditch and embankment, still very much in evidence. 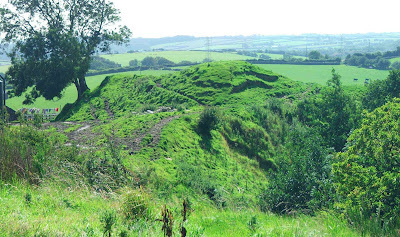 The West side is protected by a steep incline that drops away to Pennington beck below it. It's possible that the ditch and embankment here have been eroded away by the stream, as there are now no traces of any earthworks here. 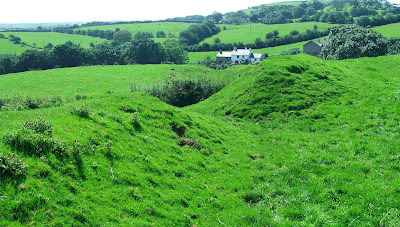 The South side is again protected by an embankment, and a steep incline that drops away to what has been considered in the past, to be the remains of a bailey area. Indeed...in some photos, what looks like masonry can clearly be seen protruding from beneath the turf. 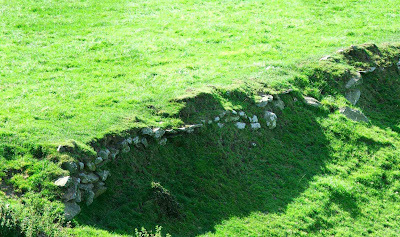 The oval shaped ring work covers an area roughly 50 by 40 metres, and the alleged bailey area is about the same size. The entrance gap that appears in the East side is probably the original entrance to the fortification, and the route that the footpath follows from the North, is most likely just an erosion mark from the many walkers that make their way through the remains. It is thought that the ring work here was held by the de Pennington family right through to around 1318, although they had already moved to Muncaster by around 1242. Aerial photos clearly demonstrate the reason for siting this ring work here. It is high above the surrounding valley, with only the hills to the West higher. 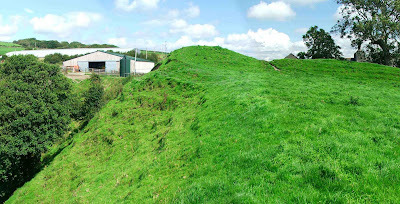 J.F.Curwen remarks in his book Castles and Fortified Towers of Cumbria... that the site was probably a motte and bailey castle with a wooden tower (never built\replaced in stone) though current thinking suggests that the site was a ring work, as mentioned above, and never evolved into a motte and bailey site. I have been unable to find any speculation as to when the castle was originally built. Would the area have been part of Scotland at this time?